1Department of General Surgery, Vijaynagar institue of Medical College, Bellary, Karnataka, India, 2Department of General surgery, MVJ Medical College, Bangalore, Karnataka, India, 3Department of Dermatology, MVJ Medical College, Hoskote, Bangalore, India. Introduction: Keloids and hypertrophic scars remain a nagging problem even with the emergence of multiple modalities in their treatment. The wide range of modalities used for their treatment also point out that no single treatment is definitively superior. Aims: The aim of this study was to define the role of Bleomycin and to confirm its effectiveness in the management o keloids and hypertrophic scars. Settings and Design: This was a prospective clinical trial involving 20 patients with hypertrophic scars and keloids. Methods and Material: The patients were treated with four monthly injections of Bleomycin and were followed for 6 months after the termination of treatment course. Assessment of the size of keloids and hypertrophic scars was done at the beginning, at the time of stopping the therapy and during the follow-up. Statistical analysis used: The response to treatment was divided into the following categories: < 25 percent flattening = poor response, 26–50 percent flattening = fair response, 51–75 percent flattening = good response and >75 percent flattening = excellent response. Results: Of the twenty patients, 13(65%) showed excellent response, 3(15%) showed good response, 2(10%) showed fair response and 2(10%) showed poor response. There was complete resolution of symptoms in 11 patients (55%) and improvement in the other 9(45%). Conclusions: Bleomycin is one of the most effective and safest modality for the treatment of hypertrophic scars and keloids. Keloids and hypertrophic scars form due to uncontrolled dermoproliferation and are unique to humans. They occur following any kind of injury and lead to considerable cosmetic blemish. The mechanism underlying keloid formation has not been fully defined though studies reveal that the activated fibroblasts and excessive collagen production are responsible for their occurrence. The word is derived from the Greek word chele, or crab’s claw, to describe the growth of scar into neighbouring skin. Although the hypertrophic scars and keloids share some similarities, there are some differences that suggest that both are distinct from each other. Clinically, keloids extend beyond the original wound, whereas hypertrophic scars tend to remain within the borders of the original wound . Presently, a wide range of treatments have been implemented in treating hypertrophic scars and keloids, including surgical excision, silicon sheets/gels, topical and intralesional corticosteroids, interferon, cryosurgery, radiation, pressure therapy, laser therapy retinoic acid, and other anti-neoplastic drugs. The focus of anti-neoplatic drugs like Bleomycin lies on fibroblasts which are the culprit cells in keloids. Bleomycin is a polypeptide antibiotic with antitumor, antibacterial, and antiviral activity . Studies have shown that intradermal injections result in significant improvement in keloids and hypertrophic scars [3,4]. Though the exact mechanism by which Bleomycin acts has not been fully elucidated, studies have shown that it inhibits collagen synthesis in dermal fibroblasts through decreased stimulation by TGF-β1 . Bleomycin also reduces lysyl-oxidase levels in cultures of human dermal fibroblasts in vitro . The effect of Bleomycin in hypertrophic scars and keloids may be from a reduction of collagen synthesis, increased destruction from inhibition of lysyl-oxidase or TGF-β1, or both. Rarely have side effects of intralesional administration of bleomycin, been reported, including hyperpigmentation and dermal atrophy. Systemic side effects of bleomycin, hepatotoxicity, and pulmonary fibrosis, are not of concern with intralesional administration . This study was initiated to confirm the effectiveness of Bleomycin in the treatment of hypertrophic scars and keloids in Indian population. The study enrolled 20 patients with keloids and hypertrophic scars after obtaining clearance from institutional review board. Written informed consent was taken from all the patients before the study. We classified hypertrophic scar as a red or dark pink, elevated scar confined to the border of the original surgical incision. A keloid is instead classified as a scar red to brown in colour, very elevated, larger than the wound margins very hard and sometimes painful or pruritic with no spontaneous regression. In each case the maximum dose of Bleomycin used was 2 mL/cm2 of skin treated at a concentration 1.5 IU/ml and a maximum of 6 mL of undiluted bleomycin was given per session. The injections were given in multiple punctures with an insulin syringe. Up to a maximum of 4 doses were administered at intervals of 1 month. The size of keloids was measured by three different observers using calipers and the mean was deduced for accurate size assessment. The response to treatment was divided into the following categories: <25 percent flattening = poor response, 26–50 percent flattening = fair response, 51–75 percent flattening = good response and >75 percent flattening = excellent response. The incidence of side effects if any was noted. Assessment of the hypertrophic scars and keloids was done at the beginning, at the time of stopping the therapy and during the follow-up. The lesions were measured and followed on monthly basis for 6 months. This study was performed on human subjects; thus, all patients were aware of the presence of the study and they were fully informed about the drug and its side-effects. Twenty (12 male, 8 female) patients were included in the study. The duration of keloids ranged from 3 to 14 (mean 6.6) years. The mean age of the patients was 34 years. A total of 20 keloid and hypertrophic scars were treated. The involved areas were as follows: shoulder, 3; neck, 2; ear, 4; chest, 8; upper limbs, 2 and face, 1. All the patients had itching, 13 had pain (65%). 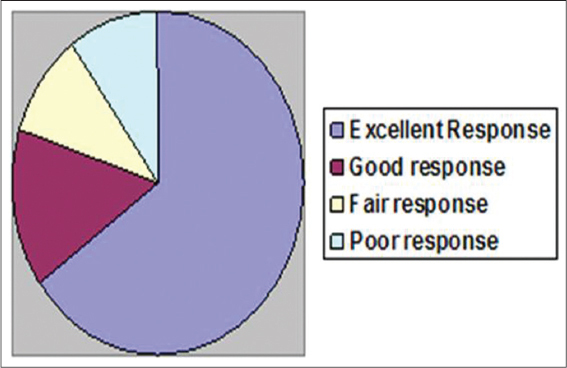 Of the twenty patients, 13 (65%) showed excellent response, 3 (15%) showed good response, 2 (10%) showed fair response and 2 (10%) showed poor response (Fig. 1). There was complete resolution of symptoms in 11 patients (55%) and improvement in the other 9 (45%). Almost all patients experienced moderate to severe pain at the injection site, which lasted about 5–15 min which were treated with a single oral analgesic. The drug was given undiluted and in multiple punctures. There was no evidence of hypopigmentation, ulceration or atrophy following injections. All the patients followed up for 6 months after termination of therapy. There were no signs of recurrence or reappearance of the symptoms. Figure 1: Response (reduction in size) following treatment with bleomycin. Aggressive fibroblasts are the reason for excessive scar formation. Antimitotic drugs selectively inhibit fibroblast proliferation and promote apoptosis, thereby inhibiting scar formation. Some drug treatments, such as steroids, 5–FU and Bleomycin have shown positive effects and have potential applications. However, complete resolution for scar is still a difficult problem. Troublesome adverse effects resulting from antimitotic drug injections also limit their application. Presently, numerous methods have been described for the treatment of keloids and hypertrophic scars, but to date, the optimal treatment method has not been established . Bleomycin is a glycopeptide antibiotics, isolated from a strain of Streptomyces verticillus. The main mode of action is inhibition on DNA synthesis and, to lesser extent, inhibition on RNA and protein synthesis. Bleomycin is used as an antitumor agent for treating various malignancies. In addition, bleomycin is used as a treatment of hypertrophic scars, and keloids. Trials have shown that administration of bleomycin by intradermal injections or the multipuncture method is effective against keloid and hypertrophic scars. The low incidence of side effects makes Bleomycin one of the safest modalities for keloid management. In similar studies, most common complication noted was minor ulceration which healed within 10 days and hyperpigmentation that resolved after 1 year of follow up . None of the patients demonstrated any pulmonary, hepatic, or other major systemic side-effects of bleomycin, which may be in part due to the low dose of Bleomycin used. Bleomycin usage has a better or comparable result as with other treatment modalities such as Triamcinolone and silicon gel sheets, and has minimal complications and less recurrence rate, which shows its usefulness as the first-line treatment modality for management of keloids and hypertrophic scars. 1. Köse O, Waseem A, Keloids and hypertrophic scars: are they two different sides of the same coin?Dermatol Surg 2008; 34: 336-46. 2. Yu Z, Schmaltz RM, Bozeman TC, Paul R, Rishel MJ, Tsosie KS, Selective Tumor Cell Targeting by the Disaccharide Moiety of BleomycinJ Am Chem Soc 2013; 135: 2883-6. 3. Naeini FF, Najafian J, Ahmadpour K, Bleomycin tattooing as a promising therapeutic modality in large keloids and hypertrophic scarsDermatol Surg 2006; 32: 1023-9. 4. España A, Solano T, Quintanilla E, Bleomycin in the treatment of keloids and hypertrophic scars by multiple needle puncturesDermatol Surg 2001; 27: 23-7. 6. Trisliana Perdanasari A, Lazzeri D, Su W, Xi W, Zheng Z, Ke L, Recent developments in the use of intralesional injections keloid treatmentArch Plast Surg 2014; 41: 620-9. 7. Saray Y, Güleç AT, Treatment of keloids and hypertrophic scars with dermojet injections of bleomycin: a preliminary studyInt J Dermatol 2005; 44: 777-84.